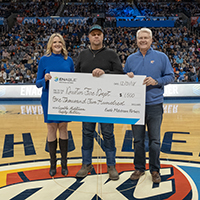 Enable Midstream Partners and the Thunder are proud to partner in the success of the communities in and around Oklahoma. We are honored to recognize local emergency responders who embody our values of safety, integrity, accountability, customer service and teamwork. 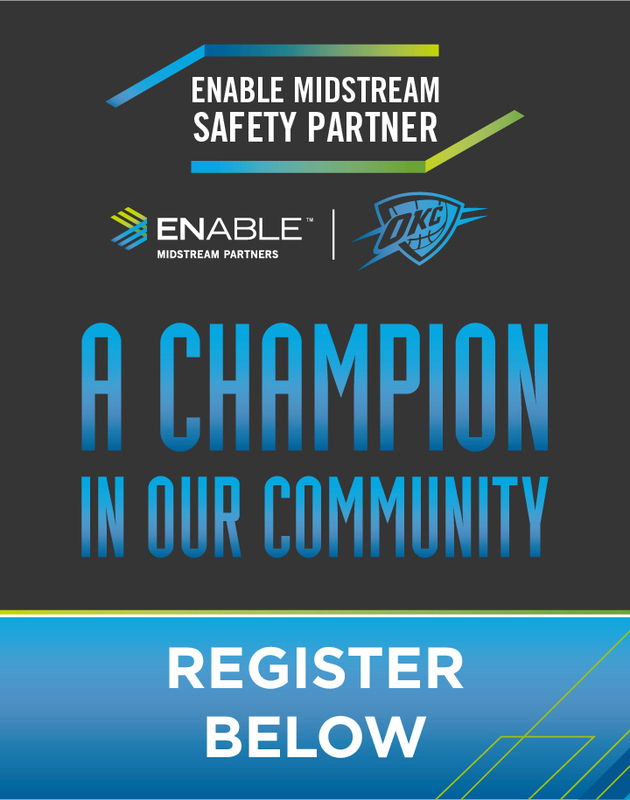 Each month, Enable Midstream and the Thunder will select a nominated first responder and recognize the contributions they have made to keeping their community safe. The Safety Partner will receive a monetary donation from Enable Midstream to be used for their organization. 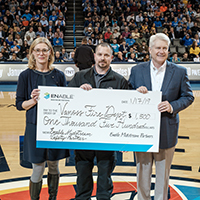 Each Safety Partner will be recognized at an upcoming Thunder game and will receive a Thunder event at their organization. 1. HERE'S HOW IT WORKS: Promotion begins at 12:01am CST on 09/14/18 and ends at 11:59pm CST on 9/30/19. Entries can be made through the following methods: Enter online at okcthunder.com/safetypartner. Entries may also be submitted through postal mail. Please send entries to: The Oklahoma City Thunder Attn: Enable Midstream Safety Partner/Megan Salomone. 208 Thunder Drive, Oklahoma City, OK 73102. All eligible entries will be judged and a winner will be chosen based on the quality of the entry in relation to the reason why the individual deserves to win. All emergency responders located in Oklahoma and surrounding areas are eligible to win. Only one (1) emergency responder will be chosen per month from November to April. After a winner is chosen, arrangements will need to be made with the winner to determine when the hometown recognition will take place. Each winner will receive four (4) tickets to a upcoming Thunder game mutually determined between the Thunder and Enable Midstream Partners. 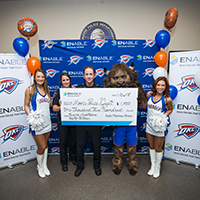 Sponsor: The Oklahoma City Thunder and Enable Midstream Partners. 2. PRIZES: Prize package includes: Four (4) tickets to a Thunder game during the regular season, in-game recognition, a hometown recognition event including appearances from: Rumble the Bison, Thunder Girls, Storm Chasers and Thunder Drummers all subject to availability, and $1,500 donation to the winning emergency responder's organization. All prizes to be provided by Enable Midstream Partners and The Oklahoma City Thunder. 3. PRIZE REDEMPTION: Winner will be notified by phone or email each month. 4. ELIGIBILITY: Promotion open to legal residents of the state of Oklahoma and surrounding areas. Employees, officers and directors of Enable Midstream Partners, the Oklahoma City Thunder, the National Basketball Association and its Member Teams, NBA Properties, Inc., its Teams an Operators, and their respective parents, subsidiaries, affiliates, partners, dealers, advertising and promotion agencies, manufacturers or distributors of sweepstakes materials and their immediate families (parents, children, siblings, spouse) or member of the same household (whether related or not) of such employees/officers/directors, and their respective parents, subsidiaries, affiliates, directors, officers, governors, distributors, advertising and promotional agencies, their immediate family members and/or those living in the same household of each are NOT ELIGIBLE. Void where prohibited by law. All federal, state and local laws and regulations apply. All federal, state and local taxes are the sole responsibility of Winner. Sweepstakes may only be entered in, or from, the state of Oklahoma. Entries originating from any other jurisdiction will be deemed ineligible. 5. GENERAL RULES: By entering, entrant agrees to hold harmless and indemnify Enable Midstream Partners, the Oklahoma City Thunder, the National Basketball Association and its Member Teams, NBA Properties, Inc., its Teams and Operators, and their respective parents, subsidiaries, affiliates, directors, officers, governors, employees and agents against any and all liability, damages or causes of action (however named or described), with respect to or arising out of (i) entrant's participation in the promotion, or (ii) the receipt or use of the Prize awarded herein. Acceptance of prize offered constitutes permission to use winner's name, voice, biographical information and/or likeness for purposes of advertising and trade by Enable Midstream Partners, the Oklahoma City Thunder, the National Basketball Association and its Member Teams, NBA Properties, Inc., the Women's National Basketball Association and its Teams and Operators, WNBA Enterprises, LLC without further authorization, compensation in all media now known or hereafter discovered worldwide and on the World Wide Web without notice or review or approval as permitted by law. By participating in these sweepstakes, entrants agree to be bound by these Official Rules and the decisions of the Sponsors. Sponsors not responsible for any typographical or other error in the printing of the offer, administration of the sweepstakes or in the announcement of Prize. By accepting a prize, winner agrees to release and hold the NBA, its Member Teams, NBA Properties, Inc., NBA Media Ventures, LLC, AAA Oklahoma, their affiliates and subsidiaries harmless from any and all losses, damages, rights, claims and actions of any kind resulting from acceptance, possession or use of any prize, including without limitation, personal injuries, death and property damage. By participating in this sweepstakes, participants agree to be bound by the Official Rules. 6. WINNERS LIST: For the name of the Winner, please send a self-addressed stamped envelope with first-class postage affixed to: The Oklahoma City Thunder Attn: Enable Midstream Safety Partner/Megan Salomone 208 Thunder Drive, Oklahoma City, OK 73102.